gem 'useragent', '0.2.3', :git => "http://github.com/jilion/useragent"
** [out :: root@10.1.5.127]  and Bundler cannot continue. The issue is discussed in length here at bundler issue tracking . The reason is that by default ruby set to evaluate any file as US-ASCII encoding. But useragent gem is having some non ASCII characters in it, so throwing the error. It can be solved by setting the default language to utf-8 which support much wider range of encoding. The solution is to add below line to Gemfile at the top. Infact, this change has resulted in a known issue for rails_admin reported here . The thread also have the solution. So what is happening due to the above change. The code is trying to check, if the object have total_count method defined on it or not. The gem owner has introduced this change to prevent “undefined method total_count” . unfortunately, it solve the error at the cost of escaping pagination. So now, we know the cause. The Solution is to define total_count method on the object . The objects here is returned from will_paginate gem. so we are going to add the total_count method to it through monkey patching . monkey patching is nothing but adding new methods or overriding the existing one, by maintaining same hierarchy of class and module in your application. Say, to solve our problem, we will monkey patch will_paginate module as below. create a file with any name say will_paginate_patch.rb in /config/intializer folder of your app, and add below line to it. so, if you see the /lib/will_paginate/active_record.rb file of will_paginate gem, you can see that, they already have per_page and count method defined in it, but there is no total_count or per method in it, so the above patch will add the method and solve our problem. Categories: errors, ruby gems | Permalink. I have explained deploying rails app on heroku in this post. I get into below error while trying to push the code on HEROKU. From the message, we can see that, there is some problem with the publickey. public key of your system should be present in your HEROKU account. just press enter, the public key is needed to push your code later on. Here, new public key is created and uploaded to your heroku account. But in my case, since my system already have the public key, my terminal log look like below. If you are not aware of certain HEROKU command you can get the detail with below step. Infact, I do not know myself the command to add the keys but get it with the below steps. 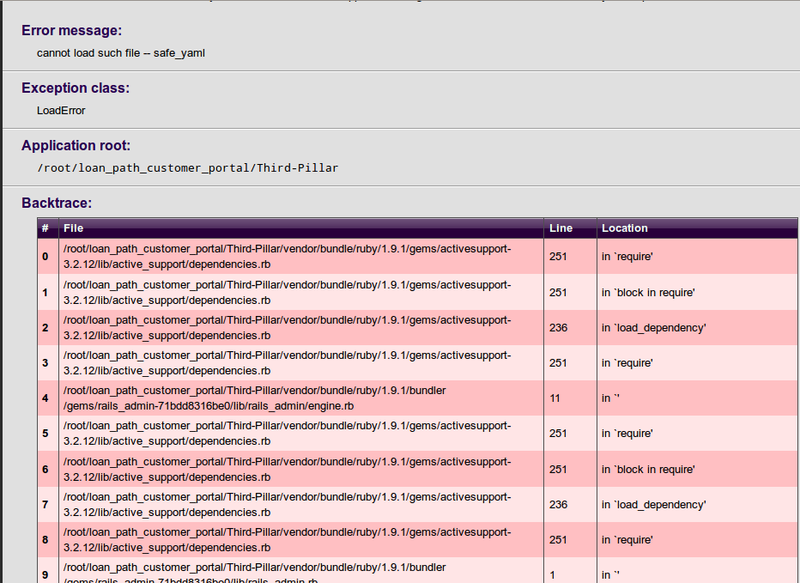 Categories: errors, rails deployment | Permalink. I have been trying to install nginx with passenger. Things worked fine untill, I copied the nginx init.d script to /etc/init.d. and tried to update update-rc.d file, I got this terrible message System start/stop links for /etc/init.d/nginx already exist . I know, what is happening here. Actually, I have tried to install nginx from source code few month back, but get into some problem and so, uninstalled it. But I think some how , System start/stop links for /etc/init.d/nginx remain there. which is now causing the problem.Well, then how to remove, the old link. As usual, to know more about any command, run it will –help option, and it will give you good amount of information, see it yourself below. update-rc.d [-n] <basename> start|stop NN runlvl [runlvl] […] . I am experimenting out with openam (installation discussed here ) as solution to my single sign on ( SSO ) need when I got below error while making API call to its REST services. The detail of all its REST services is available here . This is very strange as I am making the calls exactly as specified in there documentation here . Some of the base URL they have mentioned as example is as below. So, I’ am doing everything right, but strangely error keep occurring. From, the error itself I can figure out that the problem is with the REST API url they have documented i,e the URL itself is not valid. But, now what I can do. May, be Iam using older version of openam. But it is not the case as I have downloaded and installed the latest version 10.1.3 . Pulling, my hair for hours, before deciding to use there older API available here . SOLUTION : Use the old REST API of openam instead of current one. The legacy API is documented here . I think, they have released the documentation before releasing the version which support it. So use the older API and it will work fine. Recently, I get into strange problem, none of the browser I have on my ubuntu system: – firefox, chrome, internet explorer loading any of the web page, not even google.com get loaded. I tried to ping google from terminal but still no result. This problem generally occur if your internet conection is down. But my internet is up as I can see the connection icon up there on Right hand side of my system, Infact I can login to skype and chat with my friends. So, No doubt the problem is not with the Internet connection. Then what the hell going on here…..??? You better backup the file before deleting it as you may need to see it back if someone has made some custom change to this and want you to restore the things back. root@arun-yadav:/etc# cat resolv.conf # try to see the content after running the browser, it is empty. Recently, I am on a system with Ubuntu 15.1 . Here resolv.conf is not a normal file but a symlink file pointing to /run/resolvconf/resolv.conf , so unlike older version, here after deleting the /etc/resolv.conf file we need to recreate as symlink pointing to /run/resolvconf/resolv.conf . If the problem still exist, check the content of /etc/hosts file. In my case, it look as below. Now restart the network with below command. close the browser and start it again. It will work now . The content of resolv.conf file is getting added by juniper, which provide VPN(virtual private network) for the financial website Iam working on. When I started juniper and again see the file, I see the both entry again. when you request a page say google.com,Then name server (often known as DNS) on your system will resolve google.com to its IP address. generally, if nothing specified in resolv.conf file, the nameserver will be assumed to be that of localhost running at port 53. But, if you define it in resolv.conf file,it will be regarded as nameserver for your system, Infact If you give multiple nameserver in resolv.conf file, they will be tried in that order i,e If first nameserver not able to resolve the url into IP, the next nameserver in the list will try. So, you should mention the most reliable nameserver at top. Now above we have seen that, when we start juniper it introduce a nameserver in resolv.conf file and when we logout of it, the entry also get removed. But, last night I switched off the system without loging out of juniper, so the entry get remained there. Now, in morning, when I start to access any web page, it is trying to use DNS of juniper, which will obviously not work as Iam not connected to it, Nor I can connect as juniper url https://my_finance.com/dana/home/index.cgi will itself not get resolved. It resulted in deadlock which get removed only by deleting the etc/resolv.conf file and recreating it. Categories: errors, ubuntu | Permalink.